There’s an ancient Australian giant that has left its footprint around the world and treasure in its wake. It’s the Moreton Bay Fig, the enormous tree with imposing buttress roots that is native to eastern Australia. It has fascinated dendrologists for centuries. For thousands of years, some Aboriginals have considered them to be sacred women’s places, possibly because of the shelter they can give during birthing. I explored the site where perhaps the biggest of them all once stood, and found keyhole clues as to why this one may have disappeared. 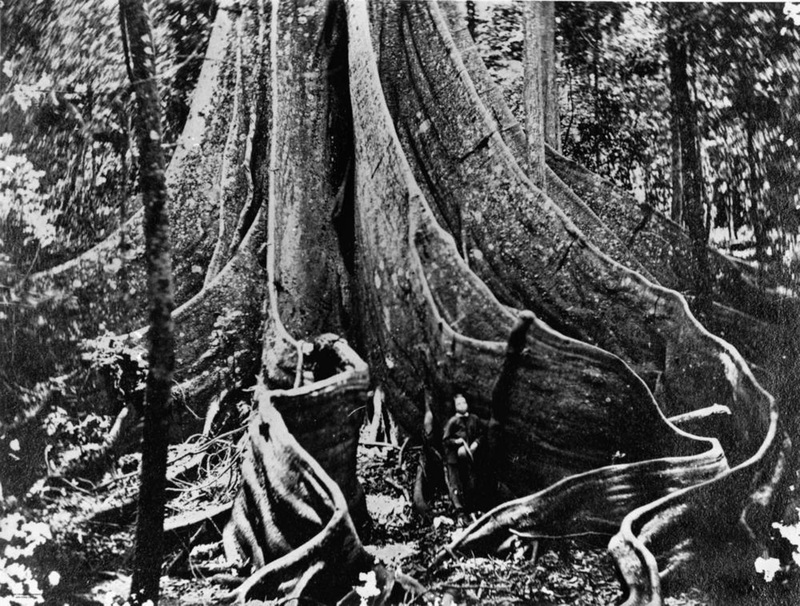 The Brisbane suburb of Fig Tree Pocket takes its name from the giant Moreton Bay Fig pictured here (above) in 1866, with a seemingly insignificant person disappearing into the foreground. There are massive specimens around today, such as the thirty metre monster in Palermo, Italy. There’s another big one in Buenos Aires, Argentina, that boasts a trunk girth of fourteen metres. One of the oldest is the heritage-listed 270-year-old veteran not far away in Ipswich, Queensland. But Fig Tree Pocket’s tree was most likely one of the the biggest of them all, said able to shelter 400 people under its massive canopy. Therein lays the problem. 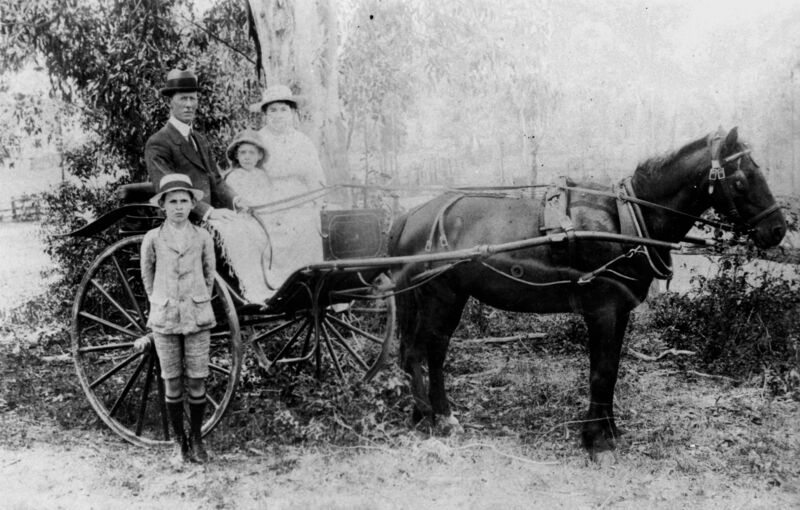 One hundred and fifty-two years ago when the tree was photographed for the newspapers, and the surrounding four acres gazetted as a park, she became one of Australia’s first tourist attractions. Picnickers in their thousands boated the thirteen miles upstream from the Moreton Bay colony to visit her banks. By 1900, tragedy had struck and the giant tree was gone, but no one seems to know why. Perhaps it was timber-getters, erosion on the river bank, or just too many people. I discovered supporting evidence for these theories and an historical trail to the present day. The constant natural disasters supports the theory that the giant Moreton Bay Fig simply slid into the Brisbane River. The newspaper quote also explains my oldest find. Equipped with a Minelab CTX 3030 metal detector (the same model used by Lance in “Detectorists”, for fans of the television show), I found an 1877 English Queen Victoria ‘gothic’ florin (pictured right). That’s a big sterling silver coin, equal to twenty-four pennies, that only “men of fair means” would lose and not be searching for to the present day! This famous florin was the first coin to feature a crowned monarch for over 200 years, and unusually has Roman numerals for its date. The 141-year-old coin is the earliest relic of the crowds of people who flocked to the tree. 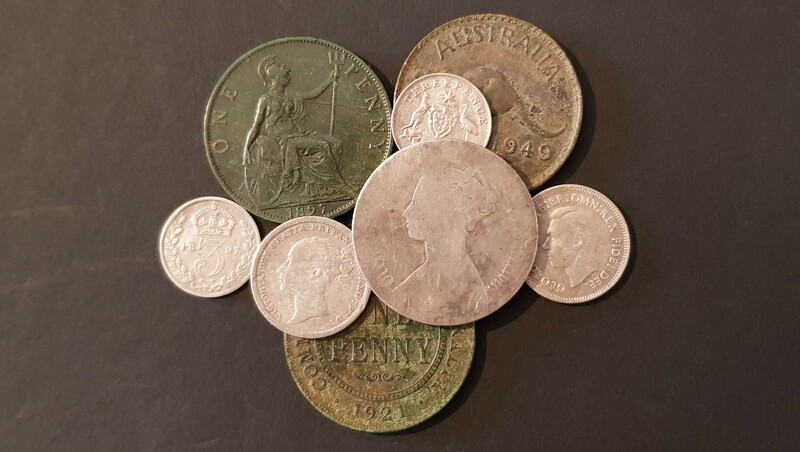 More English coins were found that predate Australia itself – an 1885 sixpence, 1897 threepence, and an 1897 penny ominously beside an axe head. Maybe the tree did fall victim to timber-getters after all. Edward Dooley was the head teacher of Fig Tree Pocket School when the First World War broke out in 1914, and the children there immediately began fundraising for the Patriotic Fund. Edward wrote, “The pupils of this small school have subscribed one pound for the Belgians, for whom they have a great sympathy: they hope that some poor little Belgian children may be as happy when receiving their gift as they are when parting with it.” Edward’s own son Kevin raised one shilling and sixpence. Here’s a fabulous photograph (above) of ten-year-old Kevin dutifully standing with his family at Fig Tree Pocket in 1918, at about the same time that he advertised to swap his comic collection for a stamp album and foreign stamps. Maybe Kevin lost those 1897 coins and they were intended for the children of Belgium. In 1923 a Fig Tree Pocket farmhouse, acquired by James Counihan for his brothers Charles and Thomas who had both served in the war, was destroyed by picnic parties. A royal visitor came in 1934 when Prince Henry, Duke of Gloucester, was given a rousing welcome by the school children as he enjoyed a forty-five minute horse ride. A penny and threepence from 1921 and 1922 were also found. Maybe they were lost by the rampaging picnic parties and are owed to the Counihans, or by the children who cheered the Duke of Gloucester. The giant fig tree was long gone by the 1950s and 60s when the Cold War was underway, but still the visitors came. 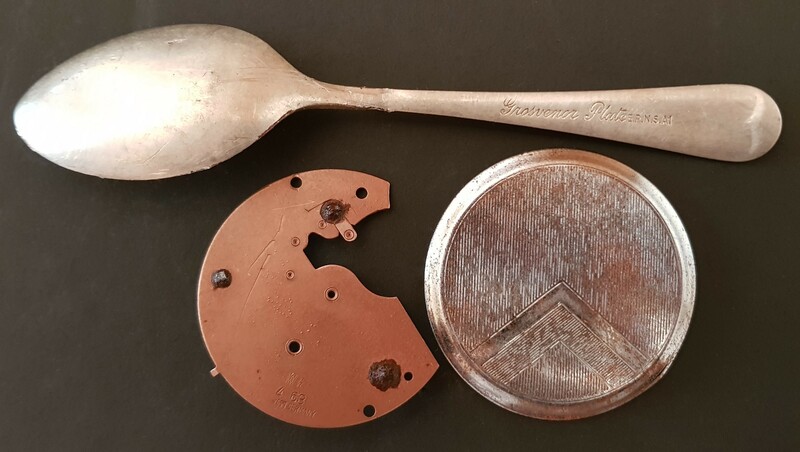 A 1949 penny, 1951 sixpence, a 1950s Grosvenor Plate teaspoon, all revealed themselves. So too a Cold War-era pocket watch made in the now non-existent West Germany in April 1963 (pictured right). Click here to see a video of a penny and the pocket watch being found. This was when Konrad Adenauer was still Chancellor of West Germany after the Second World War. He was a former leader in the Weimar Republic and then imprisoned by the Nazis during war. As Chancellor, Adenauer restored the West German economy from the battlefield ruins, presiding over the German Economic Miracle, as represented by this West German stamped watch cover. Although Fig Tree Pocket’s giant landmark fig tree is gone, the treasure it attracted can still be found. The great tree’s disappearance was probably due to a combination of the building needs of colonisation, flood, and too much picnicking love, but its beautiful memory is certainly still treasured by many. Good interesting reading as always. Especially liked the video in the park. Thanks. Hope you are plotting where you found each item, Harold. Too many detectorists (hate that word) are scavengers, removing artifacts without preserving their exact location. 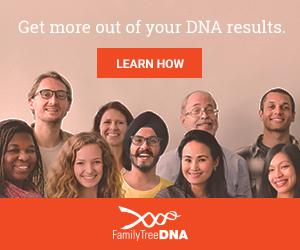 No wonder we have a bad reputation with archaeologists. Once an object is removed without record, history is lost. I recall one guy stripping a WW2 hospital site without any idea of where he found his bits and pieces. The CTX has full GPS plotting and agree very important, and to record the story too because often social history gets lost as well. It doesn’t help anyone an item sitting in a draw with no context or provenance, the true value is in its story.